A collection of short stories from the master of space opera. 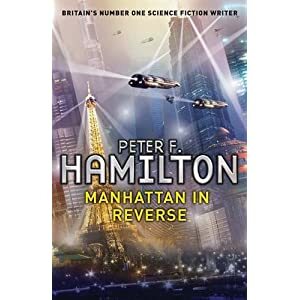 Peter F Hamilton takes us on a journey from a murder mystery in an alternative Oxford in the 1800s to a brand new story featuring Paula Mayo, Deputy Director of the Intersolar Commonwealth’s Serious Crimes Directorate. Dealing with intricate themes and topical subject this top ten bestselling author is at the top of his game. Before talking about the book itself I should mention I’ve only read two Peter F. Hamilton books (The Dreaming Void and Mindstar Rising). Both of those were in the last year, so my review is slightly coloured by my lack of in depth knowledge about the different series and various universes he has created. I have a vague awareness of some, and although I know certain characters like Paula Myo, I’m sure the stories in which she features mean a lot more to long time fans. There are also a couple of significant moments in a few of the stories, but there again I missed out on their impact as I don’t know the whole story. I think an existing fan will get a lot more from this book of short stories as most of them tie into his Commonwealth novels, but a couple of them are completely standalone. On the other hand, the book is fairly slender in comparison to all of Hamilton’s books, so it will give new fans a taste of the type of story, characterisation, technology and ideals that are typically explored in his novels. The first, Watching Trees Grow, is a very curious story that is essentially a murder mystery across the centuries. It follows a dogged investigator who refuses to give up and as advances in technology provide him with extended longevity and more tools to analysing the evidence and question the suspects, he still struggles to find an answer. The irony of how the crime is solved was not lost on me and I enjoyed the universe Hamilton had created in this story where the Roman empire still exists and major families rule. My favourite story was probably ‘If at First…’, which is a time travel story about an idea I’m sure many people have often pondered. If you were able to, would you go back to an early stage in your life and fix some of the mistakes of the past? Or perhaps relive your life again up to the present? A mad man is taken into police custody claiming that a famous tech guru, a Steve Jobs type, has done just that and his success is because he invented a time machine and has been reliving his own life with knowledge of the future. It sounds ridiculous and like the ravings of a lunatic. The suspect is a known stalker of the tech guru and coupled with that he was caught breaking into one of the tech company’s offices, it’s an open and shut case. It also sounds like a case for mental health services and yet there is something there that doesn’t ring true and the detective in charge decides to dig a little deeper. My second favourite story was the last one, Manhattan in Reverse, which to me actually felt like a bit of a western for all its SF framing. It deals with a wild frontier, a new planet full of unknowns and an attack by savage locals on the new arrivals for no apparent reason. This puzzle that is causing all sorts of problems for colonists and no one is quite sure what to do next. The simple solution would be to wipe out the problem with a big laser and not worry about it, but Paula Myo is not someone who thinks like that. She is known throughout the galaxy and her reputation has taken a bit of a knock. This simple job is pitched at helping her curry some favour with the right people so she is not shuffled off to a dark corner and forgotten about for the rest of time. The story still featured the now familiar technology I read about in the Dreaming Void, but here it was just a tool to help Paula with a very particular job. I wasn’t bogged down by some of the detail like I am in the novels, so for me it was a very light and refreshing read by comparison. As with any anthology or collection of short stories, some are better than others and some more memorable and engaging. One of the stories was incredibly short and it was specifically written to be less than a 1000 words. It showed me what could be done with very little space and it was a feat when this whole book was a quarter of a normal Hamilton novel! Overall I think this book is a great primer and a good jumping on point which gives you a good flavour about Hamilton’s style and approach to stories, characters and science fiction.